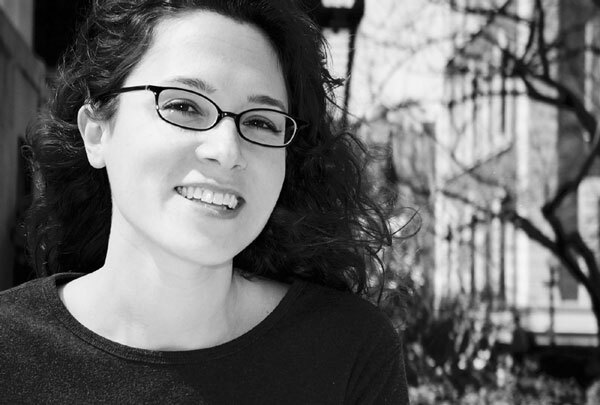 Today at Inside the Writer’s Studio, for our March Madness two day blitz, we have author Michelle Knudsen. 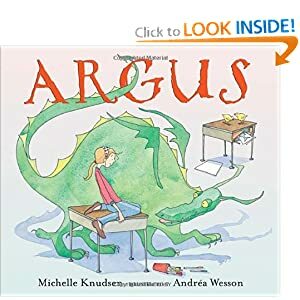 Michelle has many books up her sleeves—from the New York Times bestselling Library Lion to her fabulous fantasies, (The Dragon of Trelain is now out in paperback) and now a new picture book: Argus, which is exquisitely illustrated by Andrea Wesson. Michelle lives in Brooklyn (around the corner from where I used to live!) and is a graduate of VCFA. Mikki, as she is known to her friends is as wickedly smart as she is enormously talented. Just check out some of the raves on her newest, Argus. 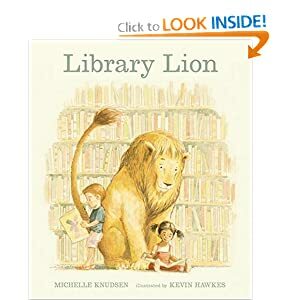 Knudsen (Library Lion) never overplays her hand, but lets the story's laughs unfold naturally from the characters and circumstances. Her grasp of the life of the elementary school classroom is spot-on; this should become another favorite. Kudos to unflappable Mrs. Henshaw, Knudsen and Wesson. With his expressive ears, wings and tail, naughty Argus will capture attention and hearts. Kudos indeed! Now on to the interview. I get much more anxious about working on something that I’m already attached to. Once there’s something there that I think is good, I’m terrified about destroying it. I have to keep reminding myself that I can always go back to an earlier draft, and coerce myself into not being afraid to move forward. Sometimes it’s important to let first drafts sit for a while, but eventually you have to take them back out and touch them, and that’s always the hardest part for me, I think. Is there a favorite quote you turn to when the rejection blues get to you? Another quote I find helpful is this one from George Henry Lewes: “The only cure for grief is action.” Doing something, trying something, making an effort to make something happen is the only way to turn things around. That one applies to a lot of areas of life, including writing. Lois McMaster Bujold. She’s an adult science fiction and fantasy writer, and she has a real gift for creating characters you wish you could know in real life. Anyone who has read Bujold’s Miles Vorkosigan series will know what I mean. (And The Curse of Chalion. And Paladin of Souls! And, uh, so on.) And at the same time, she constructs these incredibly intricate plots and creates completely believable and complex worlds, dealing with space-travel and technology and futuristic bio-ethics on the science fiction side and magical systems and demons and gods on the fantasy side. I so admire how she is able to do all of these things and create these lovely, exciting, emotionally rich stories that I just want to read over and over again. Many of my stories seem to be about characters finding a place in the world, or finding other characters who love and accept them. I don’t think I ever consciously set out to write stories with a theme of belonging or acceptance, but those themes almost always seem to find their way in. I certainly think they are concepts that everyone can relate to—who hasn’t worried at some point or another about not belonging, about not being accepted for who they are? Library Lion and Argus are both about belonging and love and acceptance, and my upcoming picture book Big Mean Mike (Candlewick Press, Fall 2012) also touches on those themes. 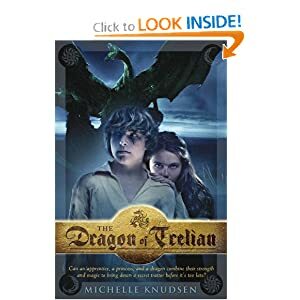 And in my novel The Dragon of Trelian (and its upcoming sequel), the friendship between Meg and Calen has been such a pleasure to develop and explore because of how much they care about and accept each other. Friendship, love, acceptance, finding a place where you belong—those are all really important to me. I’m not surprised that they keep coming up in my writing. 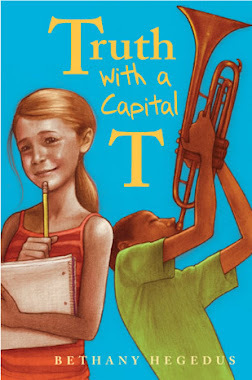 What were some of the challenges you encountered when working on this novel/picture book? How did you overcome those challenges? Argus was one of those stories I started with hope and joy and optimism and then couldn’t figure out how to finish. I must have written about twenty completely different drafts, all of them with completely different second halves. The very first draft of Argus was written in 2003! I kept putting it away and coming back to it and trying different things until I finally started to see where the story wanted to go. It’s dedicated to my agent, Jodi Reamer, and my editor, Sarah Ketchersid, because they wouldn’t let me give up. They read many, many not-quite-there-yet drafts, but they kept asking me to try again, and their encouragement really helped keep me going. It was so wonderful to finally get to a working draft, and to see that even a really slow start can get you to the finish line eventually. Argus may have taken a while to hatch, but I was very happy with how he turned out in the end. Do you have a favorite craft book? If so, what is it? And what is your favorite take away? 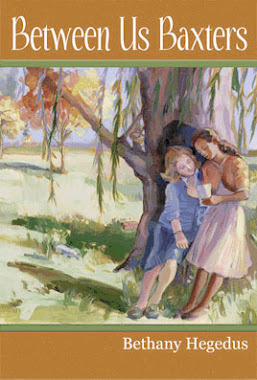 I have a bunch of go-to craft books on my shelf, all of which I keep around for different reasons, but one of the first craft books that really spoke to me was Creating Short Fiction by Damon Knight (Writer’s Digest Books, rev. ed., 1985). I found it while I was still in high school, and I love Knight’s easy, friendly manner and his take on writing craft. But the main thing that stuck with me since that first reading was a section called “Collaborating with Fred.” Fred is what Knight calls the unconscious, and I loved the idea of this little guy in the back of my brain who would send me flashes of ideas and respond to suggestions I gave him. Knight explains it much better than I can here, and the whole idea of Fred is a great metaphor for how the deeper parts of our minds seem to function and communicate with the more accessible parts. Inspired by the Actor’s Studio, what sound do you love? What sound do you hate? My cat has this special kind of murmurr-y purr she makes when she is especially happy. I can’t describe it; it’s this tiny sort of chirpy-yet-still-somehow-rumbly sing-song of contentment. Sometimes at night I’ll be up too late, sitting on my couch watching some DVD or other, and she’ll curl up next to me and make that sound and then I can’t get up, even when the show is over and I am so tired and I know I need to go to bed, because the sound she is making is so awesome and sweet and perfect that I can’t bear to disturb her and interrupt it. As for what sound I hate... angry voices shouting. And certain kinds of light jazz. “Please,” he said. And then he reached for her hand, and she was so startled she just stood there and looked down at it. It felt…nice. Not like the hand of a monster. But wasn’t that what he was? I love peanut M&Ms but won’t eat plain ones. Thanks Michelle for being here. And everyone remember if ever picking out a gift for Mikki-no light jazz and no regular M&Ms.